Erythritol is a sugar alcohol (or polyol) that is considered safe as a food additive in the United States and throughout much of the world. It was discovered in 1848 by Scottish chemist John Stenhouse. Erythritol was first isolated in 1852. In 1950 it was found in blackstrap molasses that was fermented by yeast, and it became commercialized as a sugar alcohol in the 1990s in Japan. It occurs naturally in some fruit and fermented foods. At the industrial level, it is produced from glucose by fermentation with a yeast, Moniliella pollinis. 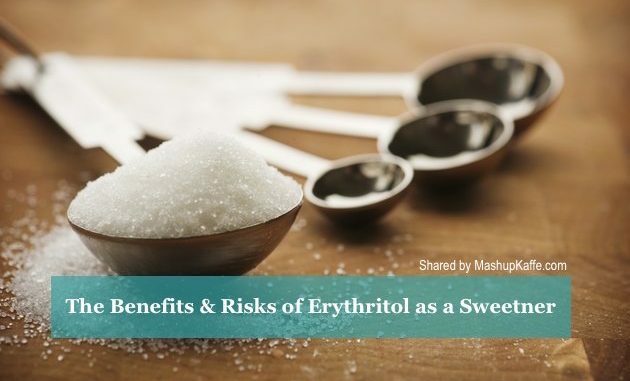 Erythritol is 60–70% as sweet as sucrose (table sugar) yet it is almost noncaloric, does not affect blood sugar, does not cause tooth decay, and is partially absorbed by the body, excreted in urine and feces. Under U.S. Food and Drug Administration labeling requirements, it has a caloric value of 0.2 kilocalories per gram (95% less than sugar and other carbohydrates), though nutritional labeling varies from country to country. Some countries, such as Japan and the United States, label it as zero-calorie; the European Union labels it 0 kcal/g. In the body, most erythritol is absorbed into the bloodstream in the small intestine, and then, for the most part, excreted unchanged in the urine. About 10% enters the colon. Because 90% of erythritol is absorbed before it enters the large intestine, it does not normally cause laxative effects, as are often experienced after consumption of other sugar alcohols (such as xylitol and maltitol), although large doses can cause nausea and stomach rumbling. In males, doses greater than 0.66 g/kg body weight and in females, doses greater than 0.8 g/kg body weight, will cause laxation. Given that erythritol is excreted in the urine, it can also be used as a tag in a drug tracking system, monitoring the consumption of a drug in testing via excretory waste tagged with erythritol. The known side effects for the regular use of erythritol are stomach rumbling, nausea, and diarrhea in higher doses (over 50 grams (1.8 oz)). Rarely, erythritol can cause allergic hives (urticaria). When compared with other sugar alcohols, it is also much more difficult for intestinal bacteria to digest, so it is less likely to cause gas or bloating than other polyols, such as maltitol, sorbitol, or lactitol. Erythritol absorption is not affected by glucose levels and therefore has great potential to be an effective substitute for sugar in diabetics. According to a 2014 study, erythritol functions as an insecticide toxic to the fruit fly Drosophila melanogaster, impairing motor ability and reducing longevity even when nutritive sugars were available. Erythritol is tooth-friendly; it cannot be metabolized by oral bacteria, so it does not contribute to tooth decay. In addition, erythritol, similarly to xylitol, has antibacterial effects against streptococci bacteria, reduces dental plaque, and may be protective against tooth decay. Erythritol is preferentially used by the Brucella bacteria spp. The presence of erythritol in the placentas of goats, cattle, and pigs has been proposed as an explanation for the accumulation of Brucella bacteria found at these sites. In the 19th and early 20th centuries, several synonyms were in use for erythritol: erythrol, erythrite, erythoglucin, eryglucin, erythromannite and phycite.